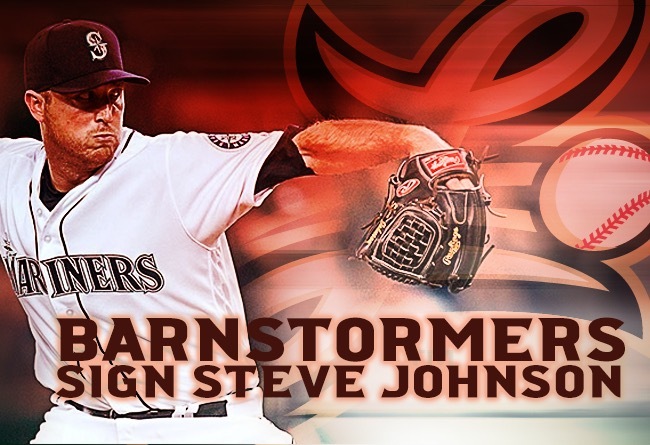 (Lancaster, Pa., April 2, 2018) - The Lancaster Barnstormers have signed former Baltimore Orioles right-hander Steve Johnson, it was announced today by manager Ross Peeples. Johnson, 30, becomes the Barnstormers’ 25th player and 15th pitcher on the current roster. The son of another former Oriole, pitcher Dave Johnson, Steve grew up in the Baltimore area. He was drafted by the Los Angeles Dodgers in 2005 and spent nearly five seasons in their farm system. The Orioles acquired him during the 2009 season in the same deal that brought current ‘Stormers hitting coach Josh Bell to Baltimore, bringing him back to his native Maryland, pitching for Class AA Bowie. Johnson finally reached the Majors in 2012, making his debut July 15 against Detroit. He went on to go 4-0, winning all four of his starts in the familiar haunts of Oriole Park at Camden Yards. The right-hander was back in Baltimore for nine appearances in 2013 and six more in 2015. He went to Seattle in 2016 and entered 16 games for the Mariners. Overall, Johnson is 6-1 with a 4.26 ERA in 43 big league games. He has yielded only 58 hits in 76 innings of work. Last year, he played in the Class AAA International League, splitting time between Charlotte (White Sox) and Norfolk (Orioles), going 2-4. His total minor league record over 13 years is 61-63. Dave Johnson, the third Oriole by that name, was a 13-game winner in Baltimore in 1990 and was 22-25 in his big league career with the O’s, Pittsburgh and Detroit. The Baltimore native has spent his post-playing career working in community relations for the Orioles and serving as a studio host on the Mid-Atlantic Sports Network.